Great shot! I know this place, was there 2 years ago. There is a fantastic view of Moscow city just behind the stall. Pity, it is impossible to show it on the same frame. 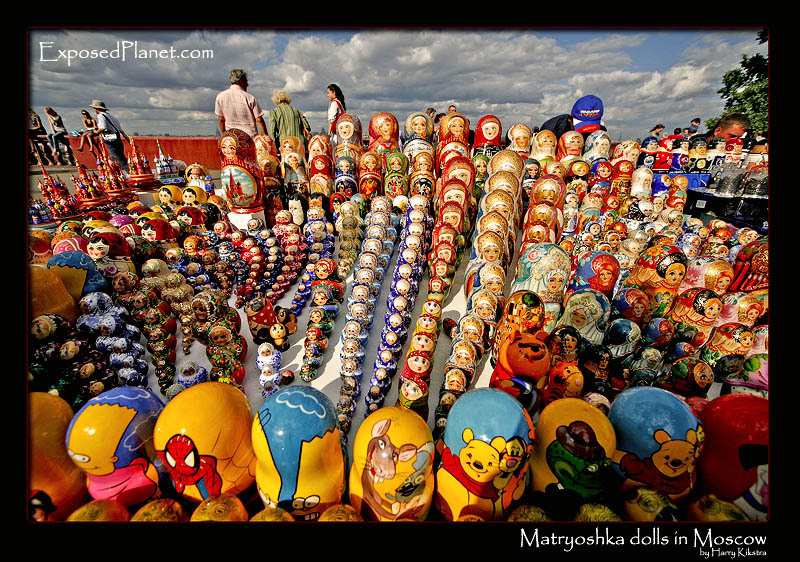 The story behind "Matryoshka dolls at the University viewpoint, Moscow"
The most popular souvenir -besides (fake)fur hats- are the little matryoshka or matrushka dolls. Produced since the end of the 19th century, the small dolls have from 4 up to more than 30 smaller dolls inside. Originally they represented the babushka’s (old women), nowadays commercialisation has changed it to Spiderman, Winnie de Pooh and Harry Potter. Also, as a result of the quick changes in presidents and the Perestrojka in the 80’s and 90’s a row of Russian presidents can be bought! Taken at the small tourist market near the viewpoint close to the huge old University building, a favorite spot for weddings as well.